When visionary pioneer John Riddoch set out in 1891 in search of gold, he did not expect to unearth an even more illustrious gift from the Coonawarra region; soil perfectly suited to producing some of the world's greatest red wines. Cutting a heroic figure with a thick moustache and finely combed hair, Riddoch's discovery spun him on a legendary path to now be recognised as a founding father of Australian wine. Savour the road less travelled like Riddoch by gifting a Riddoch Coonawarra wine from one of Australia's finest regions. With over four decades of winemaking experience, winemaking legend Neil Doddridge continues to honour John Riddoch's legacy with an award-winning wine range. Crafted from the famous Coonawarra region, Riddoch Coonawarra wines are bold and fruitful, and celebrate the region's perfect grape growing conditions tended by generations of Coonawarra winemakers for over a century. Throughout its history, the Riddoch Coonawarra range has been recognised with multiple medals at both Australian and international wine shows. 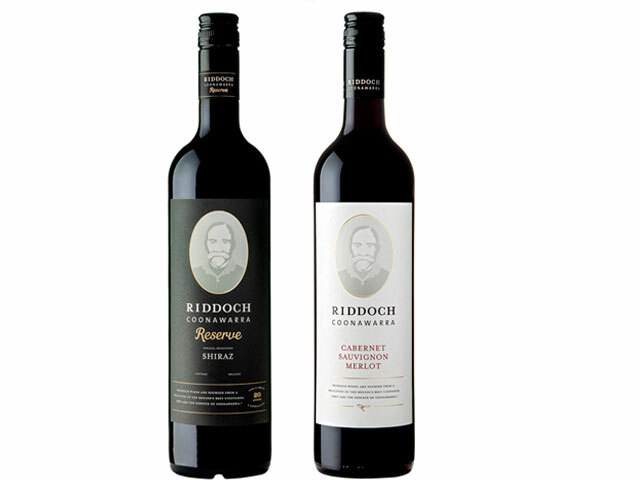 In an ode to the iconic flavour profile and strengths of the region, Doddridge has recently crafted the Riddoch Coonawarra Reserve Shiraz and Riddoch Coonawarra Cabernet Sauvignon Merlot to add to Riddoch Coonawarra's high quality range. The Riddoch Coonawarra Reserve Shiraz 750ml (RRP $35.00) is a special wine of great complexity, layering black pepper with ripe plum and blackberry. The concentrated and complex bouquet shows toasty vanillin from oak maturation, following onto the palate with layers of cherries and chocolate. Hints of spice leave a full-bodied impression on the palate, combining intense fruits with well balanced grainy tannins that complement a fine acid length. The Riddoch Coonawarra Cabernet Sauvignon Merlot 750ml (RRP $20.00) hails from one of the best Cabernet Sauvignon regions in the world. Reflecting the essence of Coonawarra, its soft palate of chocolate and dark fruit has a well-balanced tannin structure. With a nose of earthy plum, black cherry, mulberry, and fine oak aromas, this ruby-coloured wine is an authentic and exciting expression of the commitment, care and passion of John Riddoch that still inspires the Riddoch Coonawarra range. Riddoch Coonawarra's head winemaker, Doddridge says, "Riddoch Coonawarra wines honour the strong history of the region and draw on the rich soil to deliver quality wine that is truly Coonawarra." Review: In true Riddoch Coonawarra fashion, I chose to drink the Riddoch Coonawarra Cabernet Sauvignon Merlot with my Dad. Although I'm usually a Pinot Noir drinker this Cabernet Sauvignon Merlot was one of the best, I've had and Dad agreed – the subtle drop combines the perfect blend of smooth flavours and tannins. We are truly spoilt for choice with wine, in Australia. All wines are available nationally both in store and online at Dan Murphy's www.danmurphys.com.au and BWS www.bws.com.au.